The languages major promotes proficiency in two linguistic traditions and reflection on how language shapes cultural identity. The Languages program offers two majors (a first major option and a second major option) and a minor. In all three options participants have the opportunity to become proficient in two of the languages offered by the Department of Foreign Languages and Literatures, including Arabic, Chinese, French, German, Ancient Greek, Italian, Japanese, Latin or Russian. In addition, students can substitute one of the languages above for Spanish or Portuguese, Navajo or ASL. 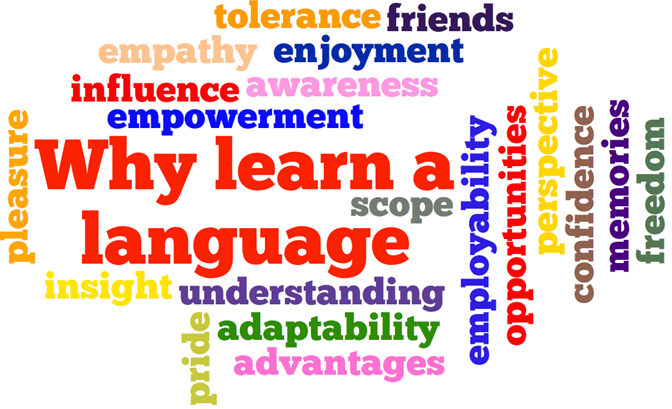 In addition to linguistic proficiency (speaking, listening, reading and writing), students studying Languages also gain proficiency in the cultures of the people who speak the languages, including insight into the historical development of those cultures and the social values and specificities of those cultures, and have the language experience and motivation needed to take full advantage of the many foreign exchange programs offered at UNM. 6 credit hours of introductory (100-level) language study in one of these languages: Chinese, Japanese, Arabic, French, Spanish, German, Italian, Greek, Latin, Portuguese or Russian. - Linguistics 301, 331, 334, 359 and/or 367. Note: A minor or a second major is necessary for Option B. Nine (9) hours of courses in each of two (2) languages at the level specified in Major requirements, for a total of eighteen (18) credit hours. Check out the University Catalog for Languages!